The debate about the representation of tone in African languages has long been dominated by the Phonemic Principle, with the result that the classic method has been to mark tone exhaustively with accents. But this approach has many difficulties. First, there is an ongoing debate about what level of orthographic depth constitutes an optimal representation. In addition, accent overload is likely to trigger visual crowding. Furthermore, it is far from clear that the functional load of tone in many of these languages is high enough to warrant exhaustive marking. Thus, in many other languages accents have been rejected, resulting in a profusion of homographs that in turn leads to miscues and incomprehension when reading. This thesis suggests that there is a "third way" that does not align itself with either extreme of the debate. It promotes a meaning-based approach that highlights the grammar instead of the phonology. 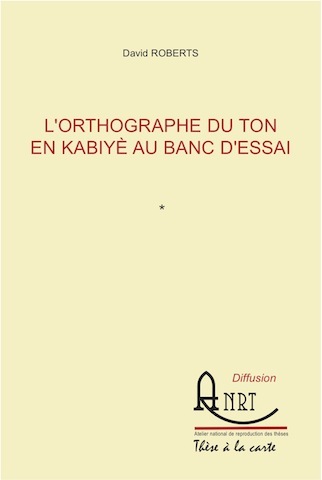 I undertake a frequency analysis and a miscue analysis in the standard orthography of Kabiye (Gur, Togo). I also take into account the role of parafoveal vision in the reading process. The resulting experimental grammatical orthography is tested against an experimental tone orthography in a quantitative experiment which includes dictation, writing and oral reading tasks. The fact that writers perform faster and with greater accuracy in the experimental grammatical orthography than they do in the experimental tone orthography suggests that they have an innate consciousness of the morphological structure of Kabiye, and that this exceeds their awareness of its phonology. Writers master weaving complex sporadic characters into the fabric of the standard orthography better than they do adding multiple strokes of the pen across its upper layer. Moreover, frequency of exposure to a particular grammatical construction in natural contexts proves to be a strong predictor of performance for those writing the grammatical orthography, but this familiarity confers no advantage in the tone orthography. May these discoveries open the door to a greater degree of creativity in the development of emerging African orthographies than has traditionally been permitted within the tight constraints of phonemic analysis with its rigid insistence on the Phonemic Principle. Download the pdfs: Thesis; Appendix, pages 1-50; Appendix, pages 51-100; Appendix, pages 101-150; Appendix, pages 151-200; Appendix, pages 201-250; Appendix, pages 251-300; Appendix, pages 301-308.
or buy the book (105 €).